Clyde Waterfront is the biggest regeneration project ever undertaken in Scotland. It brings together public and private sectors to rejuvenate 20km of the city alongside the River Clyde. Approximately 250 individual projects fall under the umbrella of Clyde Waterfront. The overarching Clyde Waterfront Regeneration Initiative (CWRI) seeks to develop a vibrant and thriving area around the River Clyde, with people and communities at its heart. The regeneration is based on the four themes of economy, place, people and connectivity. NHS South Glasgow Hospital campus (NSGH): this will comprise a 1,109-bed adult hospital and 256-bed children's hospital with maternity services, able to treat 725,000 patients a year. Due for completion in 2015, it will be the biggest hospital in the UK. Fastlink: this is a transport project, promoting rapid transit ’tram on tyres’ energy efficient buses. The new routes will improve the connection of the city centre with areas that are difficult to access by public transport. Political leadership with a long term approach - The Clyde Waterfront is one of three key political priority areas for regeneration in Glasgow. The CWRI will be developed under the Glasgow and Clyde Valley City Deal, an agreement between the local authorities in the Clyde Valley and central Government. The area is identified as a strategic priority in the draft Local Development Plan (GCC, 2014), the Council’s key spatial planning policy document. Collaboration and dialogue with all stakeholders - Widespread regeneration of the River Clyde cannot be delivered through one organisation so a Strategic Partnership Board has been created. Contribution to multiple policy objectives - Transformation and regeneration of the areas around Clyde Waterfront has been hugely significant. Projects have enhanced attractiveness and economic development potential and reduced social and economic inequality in the wider area, with improved connectivity increasing prospects and standards of living for all. Investment to date has led to 20,000 new jobs, 9,000 new homes and significant commercial development. Business models to attract investment - Clyde Waterfront is funded through public and private partnership funding. Investments of around €1.6 billion (£2 billion) have already been made. 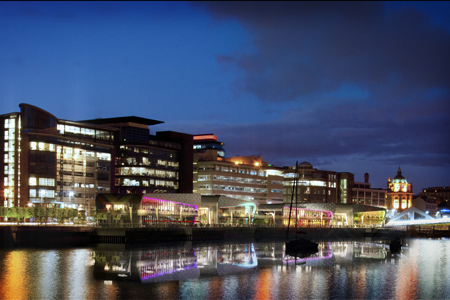 It is projected that €4-4.8 billion (£5-6 billion) will be invested over the full 25 year regeneration project. To read a full report on Clyde Waterfront and why it is a good example of a Lighthouse initiative click here.